Rain may have reduced some classes, mare I bred seemed to have a walk over in one class, any other results yet? Hi Pat - will post a full report soon (when we have more pics etc)but the promised 'prolonged torrential rain' seemed to dance around us... half our or so of drizzle early in the day and then it cleared up nicely ground was wet but had been topped... you would hope in Aug we could banich the wellies!! Clashing with 2 other local shows meant Light Horse entires were down so we will have a rethink on that front as we want to encourage our regualr supporters. brill show, really enjoyed looking at all the fab horses, and the riders/handlers were turned out to a really high standard, lovely and with rain too! Does anybody know who the show photographer was? Pictures of this show are on the above photographers site now. 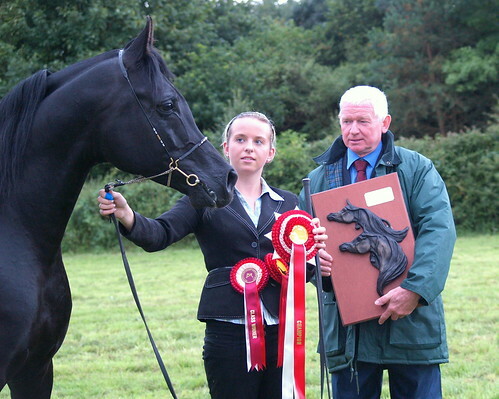 Lovely Stallion Champion! !